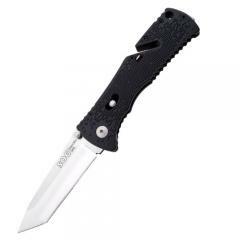 The TF-26 Trident Mini Tanto Plain Edge folding knife combines high strength with easy portability thanks to its sturdy construction and compact size. The Tanto-style blade provides extreme piercing power through the tip, allowing it to penetrate hard targets with ease. The opening system has been upgraded with SOG's Arc-Actuator® technology, providing a secure lock and faster deployment of the blade. Built-in safety mechanisms prevent accidental opening and potential injury. The handle is built from tough, lightweight glass-reinforced nylon, with patterned Digi-Grip® texturing for additional retention. It houses SOG's unique Groove® system, which allows for instant slicing of paracords, twine and other similar materials without having to open the folder. The bayonet clip is fully reversible, allowing carry on either side of the body.